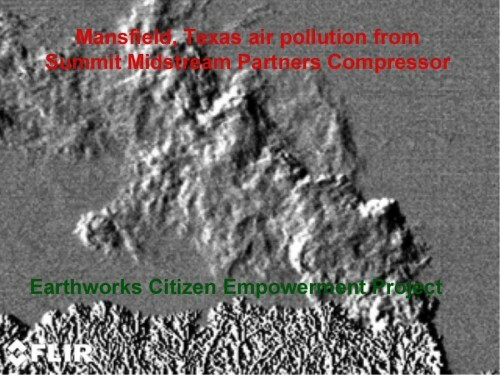 Wednesday night I heard there was a complaint made to the TCEQ due to a horrible odor in Mansfield’s Woodland Estates neighborhood so I took Earthworks’ FLIR GF 320 camera along with me just in case the citizens there needed some empowerment to prove industry is polluting their air. After making my comments to the EPA, Lance Irwin picked me up and off we went to investigate. The minute we stepped out of the car, we were struck with the unmistakable odor of hydrocarbon fumes. The FLIR camera revealed a substantial release that turned out to be an emergency blowdown. My throat started to swell and burn. 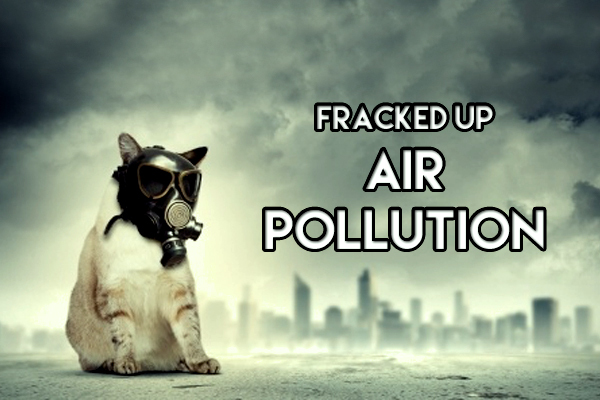 We made a complaint to the TCEQ and submitted the video below as part of the complaint. The official story from the Summit compressor operator is a familiar one to Barnett Shale residents and goes something like this: a spring broke and there was nothing but pure gas that went straight up into heaven and would cause zero problems. But, we disproved the “straight up into heaven” story long ago. As anyone can see from the video, the plume of hydrocarbon fumes is traveling out across the city and all the way past the nearby school. Additionally, “pure gas” is methane which has no odor. A release of this much methane–even pure methane, which this was not–is a great concern because methane is a powerful greenhouse gas that is 86 times more potent than CO2 on a 10-year time frame. In case you are thinking that the TCEQ will surely do something about this, the last I heard, the TCEQ has not responded to the complaints. You are on your own, people! This is why it is vital that municipalities retain local control of oil and gas development so they can protect the health and safety of their citizens. Clearly we cannot depend on the state regulators for that protection. If Representative Phil King gets his way, cities will have no control of anything, not even leash laws or dog poop! He has authored two bills, HB 539 and HB 540, designed to make it almost impossible for cities to have any local control. Mansfield is in the process of trying to beef up their drilling ordinances. Julie Dermansky has a detailed account of that process with pictures on DeSmogBlog. At the most recent council meeting in Mansfield, Irwin spoke about the danger of just the type of event we witnessed. Where is going to be located? Previous 2008 engineering plans disguised it as a water tower. The current plan has eliminated it all together. Why this is important? It is required as a protective mechanism for compressor stations and is one of the largest single emissions source at a compressor station. 2. What is its function? They are a safety mechanism that releases a mixture of existing material (methane, gas , Ethane , Benzene, etc) from the piping/pipeline through a valve as a gas plume that can project upwards to 30­60 meters in the air and last for 3 minutes to several hours depending upon the event that caused the release. One blowdown can emit 15MCF of gas on the average. Next, a range of concentrated emissions can vary by wind , but how far downwind, more than 300­400 feet? I would not want my grandparent in the Assisted living 700 ft away or my child at Walnut Creek private school on the other side when it happens. All that I have mentioned is why we need longer setbacks, closed loop systems, accident prevention, 24/7 infrared camera surveillance, baseline air monitoring and especially at this site 24/7 air monitoring. TCEQ runs on office hours and are always late to respond , A 3 hour blowdown would never see a TCEQ investigator in time . Hundreds of elderly residents 700 ft from this event are 24/ 7 residents . Schools need to be notified immediately if there is a large spike ­ just last year a young girl died from an asthma attack at the school across the street . The elderly and the school kids did not sign waivers ­ they deserve to be better protected. If you watch the very end of the video, you will see why monitors often do not work. The plume is very skinny initially and it can bypass the monitor entirely. Monitors are not prevention any more than mammograms. The best way to prevent this kind of exposure, it to keep these heavy industrial facilities out of neighborhoods. Or better yet: see The Solutions Project. Please file this under DUH!